The Open Access journal Colloquium: New Philologies, the Alpen-Adria-Universität Klagenfurt and the Alps-Adriatic-Rectors’ Conference organised the 3rd AARC PhD Students’ Conference entitled Language.Literature.Politics. 1918–2018. (Un)doing Nationalism and Resistance. The conference took place from Thursday, 20th to Saturday, 22nd September 2018 in Klagenfurt (Austria), at the Alpen-Adria-Universität Klagenfurt. 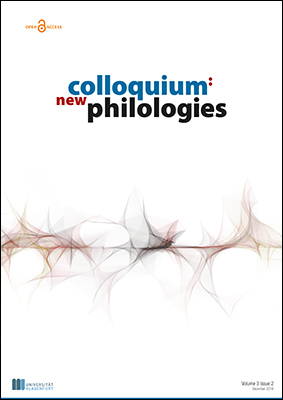 Selected paper abstracts form the Perspectives section of this Colloquium issue. Revised and amended versions of the papers will be published as a Special Issue. Preface of the conference programme: Although it may seem to many as a case of déjà vu, we actually bear witness to a cyclical turn of events in history. The world shortly after World War I seems very similar in many ways to the current state of affairs in the sense that another major push against multinationalism, multiculturalism, and globalism is clearly evident. Mirroring 1918 and the nationalist movements of the time, 2018 seems to bring a strong (or at least a loud) return to nationalism. After a long general movement into globalization, unification, and multiculturalism that has marked the period succeeding World War II, nationalism, particularly in the Western World, seems more pronounced today than anytime in the last 70 years. It is particularly rampant in the political discourse of today. On the other hand, supranational entities such as the EU, seem to be deriving new motivation precisely from the revival of these nationalistic tendencies. A thorough look is hence needed into the languages not only of nationalisms, but also of critique and resistance to them, especially into their narrative, rhetoric, and argumentative strategies, as well as their use of metaphors, images, and other devices of communication.